Imagination Technologies' PowerVR chipset is one of the most popular mobile graphics cores and now with the introduction of the PowerVR Series 7 the company is gunning for a spot in the high-performance computing market, where AMD and NVIDIA currently hold sway. The new chip offers 35 to 60 percent better performance than the previous generation and EE Times writes this could help PowerVR SoCs to get into laptops thanks to DX11 support. The Series 7 chips are the company's first to support designs that deliver up to 1.5 TFlops, using up to 512 cores -- 16 clusters, each with 32 arithmetic logic units. The high-end configuration targets notebook and console graphics, as well as servers running general-purpose GPU programs, typically under OpenCL. Nvidia has long pioneered with its Cuda environment for the GPU server, a diverse space of scientific and business applications. 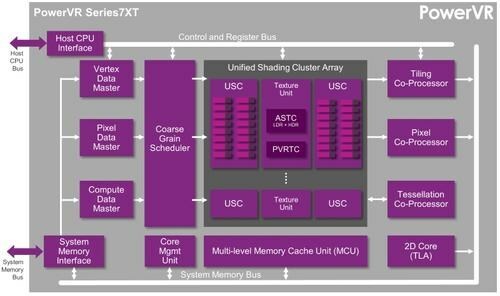 Imagination hopes its SoC customers can offer more power-efficient GPUs for high-end computing, just as ARM's partners are trying to offer more power-efficient CPUs for servers. The company has no public design wins in the sector yet.